We recommend that all individuals have an annual Eye Wellness Exam, even those who may not need glasses or contacts to achieve clear vision. At a wellness exam the doctors at Epic Vision can determine not only your refractive error (need for glasses), but also perform an in-depth eye health exam to determine your risk for ocular disease. Many eye diseases are asymptomatic initially and are often caught when a patient reports for their annual wellness exam. Because most eye diseases are irreversible, early detection and treatment is key to maintaining clear vision for years to come. Schedule an appointment today. Refractive error simply means that the shape of an individual's eye does not allow light to bend appropriately to reach the retina in focus, resulting in blurred vision. Common refractive errors include far-sightedness, near-sightedness, astigmatism, and presbyopia. At Epic Vision we offer multiple solutions for your individual refractive error. For most this means glasses or contacts, but we also work closely with the most respective refractive surgeons in our region should you prefer to not wear glasses or contacts. Some individuals with certain conditions or unusually high refractive errors may require specialty contact lenses. At Epic Vision we have access to cutting edge solutions for every type of contact lens wearer. Schedule an appointment today to determine what lenses are the best solution for your unique vision. Sometimes, vision problems aren't caused by basic refractive issues. Instead, they result from an inability to get the eyes to work together properly, keep them focused intently on an object or text, or get them to track fast-moving objects. These problems arise from the way the brain and ocular muscles are responding to the challenges presented to them. To correct these issues, we offer vision therapy. This therapy uses prescribed eye exercises, computerized visual training, and in some cases, more basic appliances. The eyes, ocular muscles, and brain are trained to work together through several sessions of this training. At the end, you or your child should enjoy improvements based on your original goals. If the goal was to see better in school, you can look forward to improvements in how long you (or your child) can read textbooks, look at the blackboard, and perform other academic requirements. If your goal was to do better at sports, both the training and your improvements will be centered on things like your ability to lock onto and track moving objects, visually react to changes in playfield situations, and make visual sense of chaotic game environments. Vision Therapy is the use of glasses, patching therapy, and even eye muscle exercises to help train the eyes to work as a team. In most cases an in-depth exam will be performed, and then recommendations about glasses and vision therapy can be made accordingly. Schedule an appointment to speak with one of our eye doctors about the best options to correct your vision. At Epic Vision Eye Centers, we evaluate and treat a wide variety of refractive and medical conditions. Many ocular (eye) health conditions have no visible symptoms, so annual wellness exams are essential to preserving your ocular health. Should you be at risk of any ocular condition due to a personal or family history of disease, please schedule an evaluation with one of our doctors today. Learn more about some of the more common eye health conditions below. Myopia, or near-sightedness, causes blur at distance. It can be caused by a steep cornea or lens, or from having a longer than average eye. Schedule an appointment to speak with one of our eye doctors about the best options to correct your vision. Hyperopia, or far-sightedness, can cause blur at near while reading. Other common symptoms include eye-strain or headaches while reading or working on the computer. It is often caused by a flatter than average cornea or lens. Schedule an appointment to speak with one of our eye doctors about the best options to correct your vision. Astigmatism means the vertical and horizontal components of your refractive error (glasses prescription) are different. Astigmatism can cause blur at all distances and for all activities. In astigmatism prescriptions, the lens has two distinct focal points to correct for the two distinct focal points in your eye. Schedule an appointment to speak with one of our eye doctors about the best options to correct your vision. Millions of people suffer from dry eyes. Symptoms can range from mild to severe, and may include itching, burning, gritty feeling, pain, watery eyes, and even blurred vision. Dryness is often age related but can affect people of all ages and may be exacerbated by computer use or environmental factors. Because the tear system is complex and made up of multiple different types of glands, treatment varies greatly between patients based on individual findings. If you've been dealing with uncomfortable eyes, make an appointment today so one of our doctors can offer you a unique approach to treatment. Presbyopia occurs when the lens in our eye becomes less flexible with age and focusing on near objects becomes difficult. This refractive condition can be corrected with glasses or contacts. Schedule an appointment to speak with one of our eye doctors about the best options to correct your vision. Glaucoma is a condition which affects the optic nerve. If the disease progresses it initially causes loss of peripheral vision but can spread to include loss of central vision as well. Glaucoma is most often an age-related condition, but other risk factors include a family history of glaucoma or history of ocular trauma. As most people know, the treatment for glaucoma is to reduce the eye pressure which can be achieved in multiple different ways. Early glaucoma typically doesn't cause symptoms, which is why annual examinations are important to determine your risk. At Epic Vision Eye Centers we have advanced diagnostic tools to help us determine your risk and any necessary treatments for glaucoma. Schedule an appointment to speak with one of our eye doctors about your risk for glaucoma today. Macular Degeneration is a condition which causes damage to the macular tissue and can lead to loss of central vision. While it is most often seen in older populations, it can occur in young people as well. One leading cause is UV exposure, so at Epic Vision Eye Centers we always recommend wearing sunglasses and a hat when outdoors. At Epic Vision Eye Centers, we have advanced diagnostic tools to help us determine your risk and any necessary treatments for macular degeneration. Schedule an appointment to speak with one of our eye doctors about your risk for macular degeneration today. Cataracts are simply an opacity in the intra-ocular lens. All people are at risk for cataracts. They can be age-related, caused by sun exposure, hereditary, traumatic, or even caused by systemic health conditions or medications. Symptoms of cataracts include blurred vision, glare around lights, difficulty seeing in the dark, and even difficulty distinguishing colors. Fortunately, cataracts are now quite treatable with surgery, and at Epic Vision Eye Centers we work closely with the most respected local cataract surgeons to ensure a smooth pre-operative and post-operative experience. Schedule an appointment to speak with one of our eye doctors about your risk for cataracts today. A true lazy eye, or amblyopia, is caused when the visual input of one eye is not as clear as the fellow eye during development. In this situation the brain determines that the less clear eye is not as important and under-develops the visual pathway for that eye. This can occur due to a large difference in the glasses prescription between the eyes, crossed eyes, or occlusion caused by an opacity or cataract. It is important to catch this condition at an early age, while the visual pathway is still being developed, to help clear the vision and give the best visual outcome. Therefore, it is important for all children, even those without vision complaints, to have annual visual exams. Treatment may include the use of glasses, patching therapy, and Vision Therapy. Schedule an appointment to speak with one of our eye doctors about the best options to correct your vision. Multiple systemic conditions and medications can affect your ocular health, including hypertension and diabetes. Medications like steroids, tamoxifen, plaquenil, and many others can have ocular or visual side effects as well. At Epic Vision Eye Centers, we have diagnostic tools to help diagnose and monitor for the changes which may occur for individuals with these conditions or taking these medications. Schedule an appointment to speak with one of our eye doctors about your risk for ocular health changes based on your systemic health or medication use. Pink Eye, or Conjunctivitis, can be caused by bacteria, a virus, or your allergies. Flashes of light and floaters can be caused by two different processes in the retina. A vitreal detachment is a normal physiologic process which occurs as we age. During a vitreal detachment the vitreous gel inside the eye shrinks and eventually pulls away from the retina and can cause new floaters and flashes of light in the process. A vitreal detachment usually does not require any treatment but should be monitored closely by your eye doctor. A retinal detachment, which can occur concurrently with a vitreal detachment but can also be an isolated event, is the process by which the sensory retinal tissue tears or pulls away from the underlying blood supply. It causes symptoms similar to a vitreal detachment, but a retinal detachment does require prompt treatment within 24 hours. If you experience any flashes of light, floaters, or loss of vision please schedule an appointment today to determine if you are experiencing a retinal detachment. Any trauma of the eye or orbit (the bones around the eye) requires evaluation. Trauma can cause ocular health issues beyond just bruising and pain. Blunt trauma can even cause retinal detachments or elevated eye pressures, both of which require prompt management. 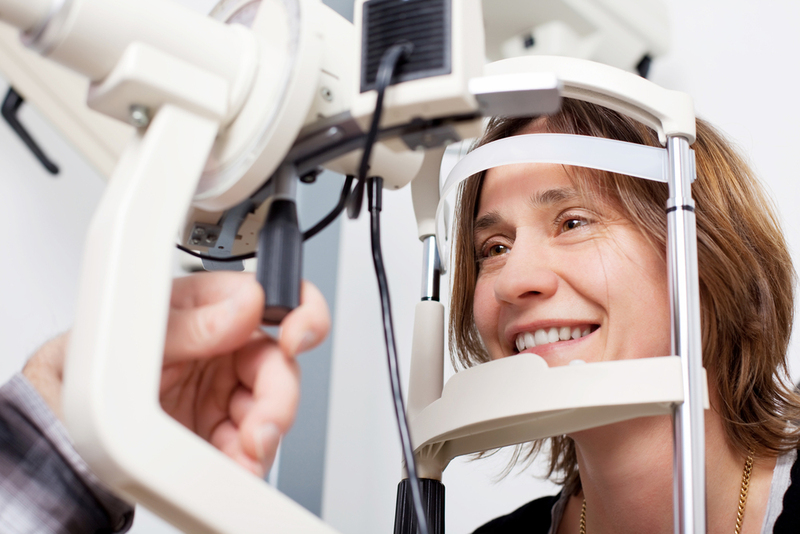 If you have experienced eye trauma, schedule an appointment today. If your injury occurs outside of our normal business hours, please seek care at your nearest emergency room. To find out more about these and other services, or to schedule an appointment, just call one of our 12 Epic Vision Eye Centers locations in Kansas and Missouri. We'll be glad to see you! Contact one of our offices today to schedule an appointment with one of our optometrists.